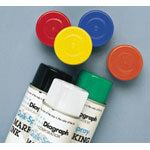 Boatman Marking provides a variety of Diagraph Spray Stencil Inks in different colors to meet your industrial needs. These permanent inks are great for stenciling or color coding, dries in just 30 to 60 seconds, complies with CONEG legislation, and is environmentally safe. Contains no CFCS, non-fluorocarbon propellant, and features new VOC-compliant formula.